On 3 January the series Historia naturalis bulgarica, along with the previous ISSN for a printed edition got a new one and began to appear as a free access online journal. 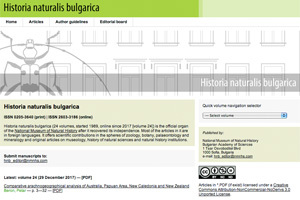 Historia naturalis bulgarica publishes original scientific articles, review articles and short communications in the fields of zoology, botany, palaeontology, geology, and original articles on museology, history of natural science, information on museum collections. On the website www.nmnhs.com/historia-naturalis-bulgarica/ the first issue of the new online edition with ISSN 2603-3186 was published. By the end of February you will be able to find the texts of all the articles of the 23 volumes of the print edition, published since 1989.